Memorial Day was originally intended as a day of solemn remembrance. *[See the end of this post for a link to a short video about the day’s origins and evolution.] Once called Decoration Day (on which widows, orphans, and other war survivors decorated soldiers’ graves), its purpose was to honor and reflect on those who died while in service to their country. Within my extended family, the day also developed a broader meaning as descendants of my great-grandparents gathered every year to honor the memories not just of all our honored military dead but of all deceased family members. In my grandmother’s hometown, kin from all over began the day at her parents’ graves, filling the weathered cemetery — for one day each year — with as many folks above- as below-ground. My long-widowed grandmother’s features took on a different expression there. Hindsight — now having lost all my own grandparents, mother, and husband — allows me to better understand the nostalgia, the sadness, the love, and the gratitude that shone from her lined face during this annual meeting of family from afar. It was a chance for Grandma’s children, grandchildren, great-grandchildren, nieces and nephews (and all their “grands,” too) to greet and get to know (by place and by story) her long-lost grandparents, parents, siblings, husband, daughter, and — in later years before her death — grandson. The cemetery on that day was not a place of sadness — though there were tears — but of reunion (both in the here-and-now gathering and in the looked-to-someday future). After beginning the day with respects paid on the sacred ground there and with family news updates shared by all, we relocated to the place and time I looked forward to when I was little: the park. Nearby, the entire city park (rented by the extended family for that day every year since long before my birth) was open to exploration. When I was a child, Memorial Day meant family reunions with buffet-style picnic foods (including as many dill pickles as I could eat from a jar that was nearly as big as I was). It meant wondering why the grownups cheered and jeered (in good fun) during their annual singles versus marrieds softball game. Close cousins and distant kin walked around wearing similar noses, foreheads, and jawlines while gesturing in mannerisms either inherited or learned in a trickle down the pyramid of Great-grandma Inez’s and Great-grandpa Edwin’s descendants. 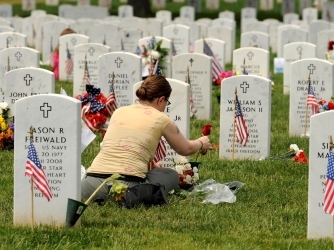 As a widow, my appreciation of Memorial Day has shifted. I’d always been taught to acknowledge that the price of my daily freedoms was paid for by the lives of those who served my country long before me. My parents taught me reverence for our flag, not as an item to be worshiped but as a tangible representation of the blood sacrificed by those who served. War was awful because of the lives it ended; warriors — of whatever nationality — were respected for their service to their nation(s). Although my family celebrated with fun traditions on such holidays, in a very real sense Memorial Day, Flag Day, and Independence Day were holy days, too. Now that I’ve experienced the loss of my own husband and witnessed my children’s thus-altered lives, my appreciation for the families of fallen soldiers has increased hundred-fold. I’m not a military widow, though I have been honored by friendships with many who are. I do not know their pain, but I have greater reverence for theirs because of my own. How can you honor and support such families on Memorial Day? Start with acknowledging their soldiers’ service and their families’ losses. Express appreciation. Share memories. Speak up. Such days are not for politicizing the “should”s or “should-not”s of specific military campaigns or politics. They are days of succoring, support, and solidarity. If you have other suggestions, please share them below! One friend sent me a link to this article by a man currently serving in the U.S. Army. PLEASE read his view on Memorial Day.